It's creamy and filling and surprisingly low fat. Its so satisfying, and easy to make, it's one of the recipes I come back to most. If you watch a lot of competitions on the food network, you know risotto is a dish that can intimidate a lot of chefs because timing is important. Its not just something you can neglect. But I've found a fool proof way to cook it. If you have 20 minutes, you can easily have a successful meal with this. Dice 1/2 of an onion. Put a large skillet over medium heat and melt 1 tablespoon of butter and 1 tablespoon of olive oil in the pan. Add your onion and sauté for a couple of minutes. Then add 1 cup arborio rice to the pan and sauté a couple more minutes. As you do this start your timer for 22 minutes. Add 1 cup white wine and cook on high until the liquid is absorbed. Stir frequently. While this cooks chop up 1 pkg of portobello mushrooms. (Or whatever type of mushroom you like.) In a separate pan cook your mushrooms in some olive oil, salt, and pepper. Cook the mushrooms down until nice and tender. Set aside. Back to the rice. You will now add 2 cans of WARM chicken broth in 1/2 cup increments. (I pop mine in the microwave to heat it up.) 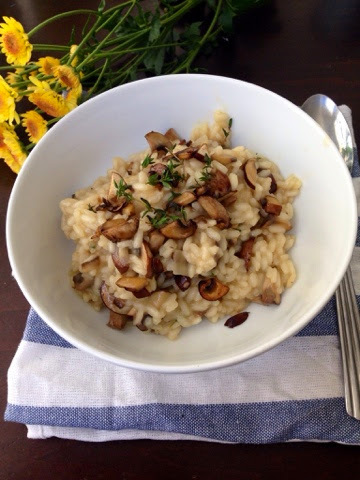 Keep stirring the risotto frequently and only add the next 1/2 cup when the previous liquid has been absorbed. Your goal is to get all of the stock absorbed by the time the timer says 22 minutes. You may need to turn up or down the heat based on how much time is left. I usually keep mine on high the whole time and just stir it constantly. Then stir in 1/2 cup grated Parmesan cheese. Add 6 or 7 sprigs of Tyme. Add in your mushrooms and salt and pepper to taste. This should give you a very creamy and rich tasting dish! I know you will love it and hopefully come back and remake it as often as I do.